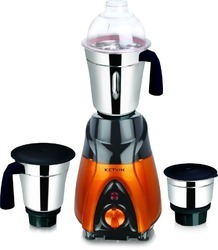 We are a leading Manufacturer of trendy mixer grinder from Mumbai, India. Keeping in mind the changing requirements of the customers, we are involved in manufacturing and supplying a wide assortment of Trendy Mixer Grinder. Mostly preferred in commercial and residential kitchens to mix any types of edible items, the offered mixer grinder is properly examined at every stage of manufacturing process. Further, our Trendy Mixer Grinder is available in various designs, colors and sizes as per the variegated needs of clients.